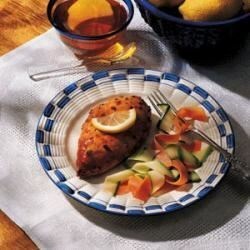 "In just over 30 minutes, you can enjoy chicken breasts topped with a light, refreshing sauce that combines honey with lemonade, mustard and herbs." Place chicken breasts in a 13-in. x 9-in. x 2-in. baking dish coated with nonstick cooking spray. In a small bowl, combine remaining ingredients; mix well. Pour half over the chicken. bake, uncovered, at 350 degrees F for 20 minutes. Turn chicken; pour remaining sauce on top. Bake 15-20 minutes longer or until meat juices run clear. Nutritional Analysis: One serving equals 268 calories, 70 mg sodium, 78 gm cholesterol, 31 gm carbohydrate, 29 gm protein, 4 gm fat. Diabetic Exchanges: 4 very lean meat, 2 fruit. A new favorite of ours! I used lemon juice and sweetener instead of the lemonade concentrate. Great taste, great recipe! I used orange juice instead of lemon concentrate, added 3 jalapeno peppers (no seeds).